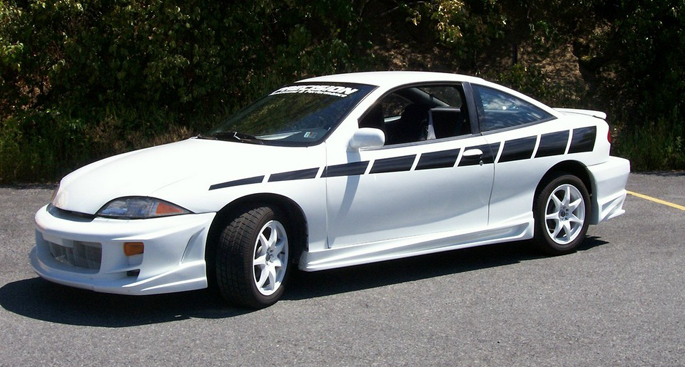 The Chevrolet Cavalier is a compact automobile produced from 1982 to 2005 by General Motors. Built on the company's J platform, the Cavalier was one of the best-selling cars in the United States throughout its life. The Cavalier first went on sale in early 1981 as a 1982 model with front-wheel-drive, a choice of two carbureted four-cylinder push-rod engines, and 2 and 4-door sedan, hatchback, and station wagon body styles. Convertibles were added in 1983, initial production totaling less than 1000. 1983 Cavaliers offered throttle body fuel injection, and a V6 engine became available in 1985, uncommon for a subcompact car. The 1984 models received a mild facelift featuring quad headlights. The first generation Cavalier was largely identical to the Pontiac Sunbird. 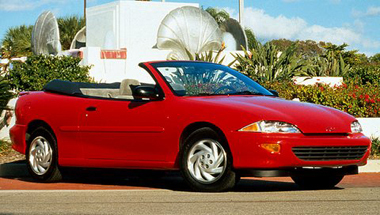 Before the Pontiac brand was officially introduced in Mexico in 1992, Cavaliers sold there featured Sunbird body panels, as opposed to US-spec Cavalier panels. The second generation Cavalier was restyled in 1988. The two door hatchback was dropped. The sedan and wagon were unchanged from the doors back, while the coupe's exterior was completely redesigned. This resulted in different trunk designs for the coupe and sedan. Three trim levels were available in 1988: VL, RS, and Z24. With all trims, 5-speed manual transmission was standard, and a 3-speed automatic was optional. An electronic dashboard was available with the RS and Z24 trims. A new 2.2-liter, DOHC, 16-valve, "Ecotec" four-cylinder engine appeared in the Cavalier for the first time during the 2002 model year. While base Cavaliers continued with the ancient OHV 2.2-liter four and the Z24 still had the 2.4-liter unit, the 140-hp Ecotec was a clear improvement over any previous Cavalier power plant in terms of overall drivability and refinement. The 2.4-liter engine was dropped in 2003. 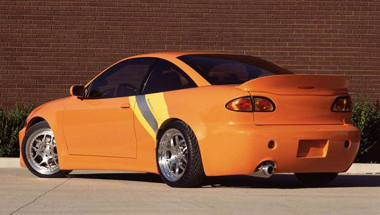 Styling Chevy Cavalier Accessories freshened the appearance of the Cavalier for 2003. For 2004, a gold Chevy bowtie replaces last year's silver crossbar applique. Otherwise, its appearance is unchanged. The front and rear of the car were redesigned for 2003, and the LS Sport model received new rocker moldings and integrated fog lamps. The front end displays Chevy's new gold bowtie emblem. Bright colors are available, including Rally Yellow and Sunburst Orange Metallic. Chevrolet Cavalier has a nice interior design and the interior materials appear to be of decent quality. A hood over the instruments sweeps organically over to the passenger side giving it a contemporary appearance. The thick, contoured steering wheel in the LS Sport Sedan feels good. Power window switches are located on the center console, however, harder to find and more awkward to operate than when they're on the door. The driver's window has an Auto-Down feature. Cavalier uses disc brakes in front, drum brakes in the rear, instead of the preferred and more expensive rear disc brakes. Anti-lock brakes (ABS) come standard on LS models. Slam on the brakes and the ABS steps in, bringing the Cavalier to an undramatic stop. ABS can be a real ally in an emergency maneuver because it allows the driver to steer the car in a panic braking situation. Just remember to keep hard pedal pressure on the brakes and don't forget to steer. Today's advanced safety features include side-curtain airbags, active head restraints and airbag occupancy sensors.